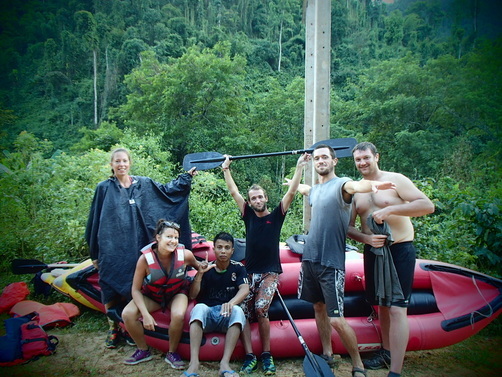 Kayaking or Rafting for 3 days on the Namha and Namtha river, Namha National Park - Trekking in Luang Namtha, Laos - Hiking, Kayaking, Cycling, Village Tours - Discovering Laos! 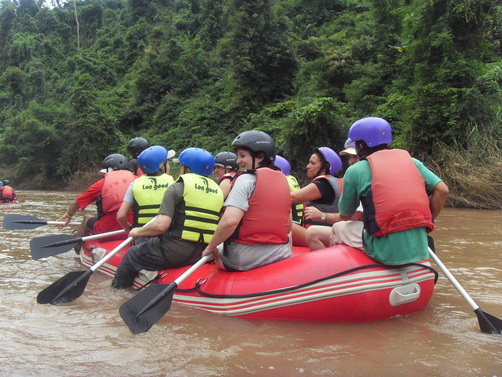 Great for water warriors needing the thrill and adrenaline powering rivers of Luang Namtha over 3 full days! Experience the power of the Namha river as you tackle one thrilling rapid after another, set against a backdrop of dramatic natural scenery at the heart of the Namha NPA. During the wet season the Namha river is one of the fastest flowing in Luang Namtha province. Face head-on the mighty Namtha river, as you tackle exciting rapids set against a backdrop of dramatic natural scenery. The Namtha river is the largest river in the province of Luang Namtha and provides excellent kayaking thrills year-round. Experience village life by spending two nights at a homestay or eco-lodge as a guest of the Khmu people at two separate and unique villages. Each day enjoy an authentic Lao-style picnic lunches at truly unique and picturesque riverside locations. Watch dramatic scenery unfold while paddling downriver, tackling exciting rapids and visiting remote communities on the way. We meet at the Discovering Laos office for 9:00am and hop aboard a tuk-tuk, which takes us directly to Tha Sae village and the start of our river adventure. Following basic instructions on paddling techniques and safety we begin paddling down the gorgeous Namha river, flowing directly through the heart of the protected biodiversity and conservation area. After paddling down the fast-flowing river through exciting rapids we find a picturesque riverside setting, perfect for a Lao picnic lunch and, as highly recommended by all, a refreshing swim in the river or waterfight! Back on the river the current quickens and we encounter a thrilling series of rapids, set against a backdrop of outstanding natural beauty, as lush jungle rises steeply from the riverbank and the air is filled with the sounds of wildlife. Further downriver we visit a charming Khmu village for the chance to meet the locals and learn about their unique culture. By 4:00pm we reach Nalan village of the Khmu people, a remote settlement deep in the jungle and our home for the night. After meeting the locals and exploring the village you can take a dip in the river and relax. At 7:00pm a delicious Lao dinner will be served, after which spend time socializing with the locals or head straight to bed at the comfortable eco-lodge. 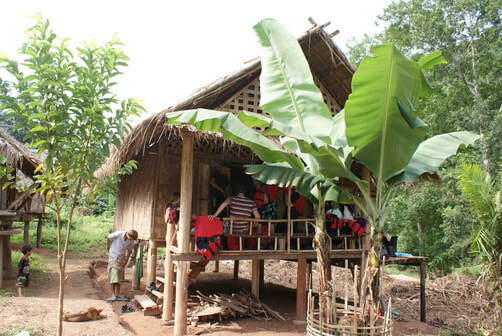 Wake up to the sound of village life with a tasty Lao breakfast and hot drink. At 10:00am we begin paddling downriver, easing ourselves into the day with a couple of short visits to Khmu riverside villages. Soon after we find ourselves paddling through a dramatic cascade of roaring rapids. 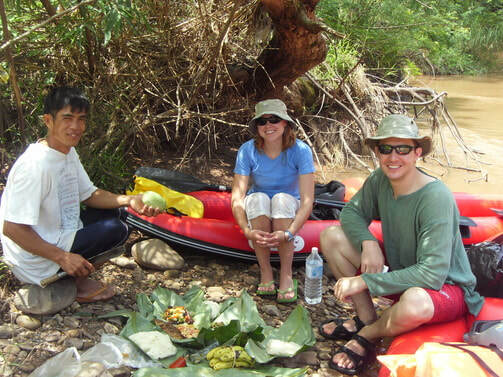 As on the previous day we find a calm stretch of water paddling through scenic surroundings and stop at a scenic spot for another delicious Lao picnic. After lunch we continue paddling downriver; the stunning beauty of the Namha landscape opens before us, as stretches of calm water offer the chance to spot tropical birds and aquatic wildlife. Before long the current grows in strength. We speed through a series of rapids and fast-flowing channels before emerging on the mighty Namtha river. By 4:00pm we reach Houy Leuat village, our place to stay for the night. Wake up to a tasty Lao breakfast and drinks, freshly prepared as always by our cheerful guides. At 10:00am we start paddling downriver past a rustic landscape carved into a rich mosaic of cultivated jungles. After stopping off to visit a couple of quaint Khmu villages we find a perfect location on the river for a lunchtime picnic. Leaving behind the rice paddies and cultivated jungles, the river suddenly widens and the steep hills rising above become dense with lush tropical forest. Soon after we are tackling a dizzying number of exciting rapids, before reaching Hat Naleng village and the end of our river adventure. A tuk-tuk awaits out arrival for a relaxing and scenic two hour ride back to our Discovering Laos office for approximately 5:30pm. The price ranges from $85/person (USD) for 8+ Pax to $282/person (USD) for 1 Pax. Note: Warm clothes for the evening and night is advisable during the winter, between Oct-March and especially to change into for the tuk-tuk ride back to the office.